This week includes my annual list of the best wines I tasted during the 2017 calendar year. As is my annual custom, I also list the most exciting and/or interesting wines I tasted throughout the year, many of which give more pleasure than some of their “near-perfect” brethren who are included in the former, more prestigious, list. With the number of wines I tasted this year (2,531) once again surpassing the number tasted the previous year (2,085), it is safe to say the world of kosher wine continues to evolve, grow and improve and there are great things ahead for the industry. The kosher wine consumer base continues to grow in size and purchasing power while developing more of an appreciation for better wines. These developments and many others will be discussed in the next editions of my Annual Trifecta; a summary of the 2017 wine year and my crystal-ball analysis of what 2018 will bring. Given that I taste many wines well in advance of their official release, it’s worth checking out last year’s “Best of” list for some of the best wines that are currently on the market. 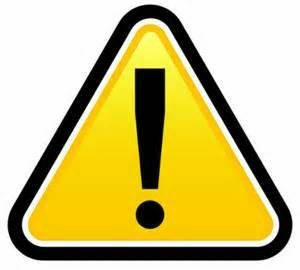 A number of factors contribute to a significant delay between the bottling of a wine and its official release (including importers and retailers holding back new vintages until the prior vintage is depleted) and, as a result, certain of the wines listed below may not officially appear on the market for a while (but the wine’s from last year’s list should tide you over if needed). 1. In keeping with past practice, the list includes only wines I tasted for the first time during the 2017 calendar year (although barrel tastings from prior years that I tasted as final wines this year are included), with only final and bottled wines are eligible for this list. 2. The list doesn’t include older vintages of wines I tasted for the first time throughout the year. With the 57th gathering of the Rosh Chodesh Club behind us and our fifth anniversary just around the corner (along with tremendous global growth), the list would be overrun with many of the magnificently cellared wines enjoyed at RCC’s 20 franchises over the last 12 months. 3. A handful of wineries are constantly producing so many terrific wines that the list could be comprised solely of their wines (g. Capcanes, Covenant, ElviWines, Flam, Hajdu and Tzora). With the recent influx of high-end French wines (another topic that will be discussed in depth in the coming newsletters), they represent the highest percentage f this list ever. However, in order to reflect the wonderful diversity of today’s quality kosher wines, I have limited the number of entries by any specific winery to ensure a more inclusive (and comprehensive) list. 4. Once again, I decided to avoid wines of such exceptional rarity as to render them impractical for the bulk of readers. As such, wines I personally tasted and loved throughout the year that were non-commercial (g. Napa Valley Reserve 2014), exceptionally rare or [currently] only available in limited markets (e.g. the 2012 Gevry-Chambertin Pinot Noir from Domaine D’Ardhuy in Burgundy or the new Rieslings from the non-Nik Weis Gefen Hashalom wineries) aren’t included. 5. Reflecting the geographically widely disparate location of my over 9,000 readers (approximately 70% US, 15% Israel and 10% spread throughout the rest of the world), some of the wines may not be readily available in one market or another (a winery’s flagship wine(s) are typically produced in relatively small quantities and thus sell out fast or are not exported). 6. Despite my best intentions and efforts, four children and a rather demanding day-job continue to limit my wine-tasting travel and I wasn’t able to taste every one of the more than 3,300 kosher wines released this year. Combined with a slowly failing memory, these lists aren’t 100% set in stone and there are dozens of other worthy-wines worthy of your time, attention and wallet. Capcanes, Peraj Ha’Abib, Flor de Primavera, Montsant, 2015: As noted above, Capcanes is one of those wines that make a play for this list every year, usually getting its way and 2015 was no exception. As always, a blend of the winery’s three varietals – Cabernet Sauvignon, Grenache and Carignan (the latter two also bottled as individual varietals in the La Flor series), with this years blend around 55% Grenache, 30% Carignan and approximately 25% Cabernet Sauvignon. With even more Grenache than the 2014’s already increased percentage, Jürgen’s love of the floral elegance and supple finesse the varietal brings to the blend is obvious. Deep, rich and extracted on both the nose and full bodied palate with loads of rich black fruit, tar, floral notes, lavender, dark chocolate, fresh-cracked black pepper and roasted game along with lovely bitter herbal notes on a bed of gripping yet supple tannins and great acidity that keeps things vibrant. Layers of aromas reveal themselves slowly and lead into a mouth-filling and lingering finish. A rich and powerful wines that is still coming into its own, and the high-quality grape and masterful winemaking ensure that the 15% AbV doesn’t get in the way. Give this one until mid-2019 before opening and then enjoy through 2030, maybe longer. 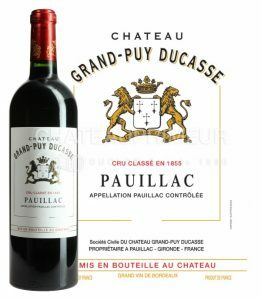 Château Grand-Puy Ducasse, Pauillac, 2015: Another great French offering from the supremely approachable 2015 vintage year. While “only” a Fifth Growth, it’s important to realize the ranking was based on futures pricing in 1855 and many great wines come from low (or un-)ranked tiers (the incredible Pontet-Canet is also a Fifth Growth) and it represents one of the highest available kosher offerings from the well-regarded Pauillac region (home to three of the five first Growth châteaux). One of the wineries whose châteaux isn’t located within he vineyards, Grand-Puy Ducasse has vineyards spread throughout many prestigious areas of Pauillac and sources grapes from all of them to create the wine which typically spends 18 months in approximately 50% new French oak, with this wine clocking in at 14% AbV. Despite being planted with 62% Cabernet Sauvignon and 38% Merlot this wine is primarily Cabernet Sauvignon with only a bit of Merlot mixed in. Like many of its 2015 brethren, the wine opens with an expressive and voluptuous nose of rich and ripe black cassis, crushed blackberry, plums and dark cherries with rich dark chocolate, nuanced herbal notes and earthy minerals providing lovely complexity along with cigar-box wood and freshly sharpened pencil. The full-bodied palate is highly extracted, rich and deep and needs plenty of time to settle down before it will be ready for prime time and culminates in a finish that lingers nearly forever. With powerful tannins providing great backbone for the rich fruit and plenty of lovely acidity in balance with the oak and tannins, this is a beautiful and elegant wine for the ages that will be enjoyable for many stops along the way as well. Drink 2025-2035. Château Lascombes, Margaux, 2015: One of the many new French arrivals coming to your local kosher wine retailer in a few months. As will be discussed in depth in my summarizing newsletters, kosher French wine is making a huge comeback with many new top tier options on the market for vintages 2014 – 2016. With 2015 a particularly approachable vintage yielding more than its fair share of floozies, it will be easy for increasingly sophisticated consumers to get behind this new slate of French wines with Château Lascombes best-suited for this given its position as the most New-World of all Margaux châteaux. While 2015 hasn’t yielded a kosher First Growth wine yet, Lascombes joins the growing list of Second Growth châteaux who have produced kosher cuvées (the others being Château Rauzan-Gassies, Château Léoville-Poyferré, St.-Julien and Château Gruaud-Larose. A blend of 50% Cabernet Sauvignon, 47% Merlot and 3% Petit Verdot, the wine typically spends 18 months in approximately 80% new French oak and clocks in at 14% AbV (reflecting the riper vintage). The wine open with a rich and expressive nose loaded with ripe raspberries and plums along with rich crushed black fruits, dark chocolate, warm cedar, freshly cured tobacco, lead pencil, warm brown spices along with nuances of toasted oak, roasted hazelnuts and a whiff of anise. The full-bodied palate is plush and voluptuous with gripping tannins and good acidity is near-perfect harmony with the rich fruits and most of the same notes form the expressive nose along with pungent mushrooms, rich dark forest floor and a lovely salinity providing complexity on the multi-layered palate that reveals itself over the course of hours. Despite the somewhat remarkable approachability, this is a powerful and robust wine with plenty of gas in the tank for long term magnificent aging. Drink 2022-2035. Château Smith-Haut-Lafitte, Pessac Léognan, 2014: Different from many Bordeaux estates, Smith Haut Laffite produced both red and white wines (with approximately 86% devoted to red wine production). While there was only one kosher cuvée ever produced of the white wine (for the vintage year 2004), the château d has released a kosher red cuvée for the 1995, 2000, 2000, 2009 and 2014 vintages. Following on the voluptuous and approachable 2009 vintage of this wine which has achieved near cult-status in the kosher wine world, the 2014 returns to the Old World style the winery is known for. The highly extracted nose is loaded with rich notes of mostly black fruit, cigars, anise, lack olives, saline minerals and pungent forest floor with nuances of smoky oak, roasted meat and Oriental spices. The full-bodied palate has caressing tannins that need plenty of time to integrate but hold great promise of long-lived harmony and balance with much of the nose present long with caramelized almonds, roasted coffee, more black olives, a touch of herbacousness and layers of complexity that take hours to reveal themselves culminating in a long-lingering finish. Drink 2025-2040. Covenant, Solomon, Cabernet Sauvignon, Lot 70, 2014: With plenty of ink already spilled on the wine’s “name”, this note focuses on the wine itself. Labeled by the editors of Food & Wine as “the best kosher Cab made in the U.S.” while remaining a “world class wine”. While I am not ready to crown it the best of a class of 2014 that showcases some of the best Cabernet Sauvignon I have seen to date out of California (with Herzog having some amazing stuff in their lineup as well), I wholeheartedly concur with the second part – this is a terrific wine sourced from Leslie Rudd’s Oakville estate vineyard and certainly a step up from the already lovely “regular” Covenant. The wine spent 18 months in 50% new French oak and presents at 14.5% AbV with an extracted and voluptuous nose loaded with crushed black forest fruits, ripe black cherries, cassis and chocolate alongside slightly smoky oak, anise, rich minerals and pungent earthiness while retaining that hint of herbaceousness that typifies Covenant’s offerings, with enough time one could lose himself in the aromas alone. However that would be a shame as the extracted and full bodied palate has plenty to offer as well with rich, dark and deep fruits alongside complex layers of herbs, spices, anise and more chocolate that slowly evolve if they are given enough time. While enjoyable now, I’d recommend giving the wine at least another six months before opening after which it should cellar nicely through 2025. Flam, Noble, 2013: Since the first kosher release for the 2010 vintage year, this wine has been a perennial participant in this annual list. Given its indented personification of Golan flam’s winemaking expression, the success shouldn’t come as any sort of surprise. With the winery’s entire portfolio typifying restraint and elegance, Flam’s flagship offering showcases the best they can do and certainly lives up to being “the prime of the premium” – an apt descriptor coined by Israel Flam. It is interesting to note that while many Israeli winemakers are shying away from the Bordeaux varietals in a search for grapes more suited to the hotter Mediterranean climate, three of Israel’s top wineries (Castel, Tzora and Flam) continue to make restrained and elegant top tier wines from these varietals. A blend of 67% Cabernet Sauvignon, 18% Merlot, 9% Syrah and 6% Petit Verdot, the various components were vinified separately and spent 18 months in 85% new French oak before being blended and returned to the barrels for another six months. Keeping with the wine’s tradition, it was then bottle-aged for an additional two years in the winery’s cellar before being released. Despite being a “Judean Hills Winery”, Flam continues to source a portion of its grapes for this wine from its better Upper Galilee vineyards located in Kayoumi and Dishon (along with their Judean Hills Mata vineyard) and Golan feels this is the best Noble yet. With their 2014 Reserve Merlot being among the best of the bunch, I was happy to see the increased percentage of Merlot in the wine, giving it more power than the 2012 while retaining the characteristic elegance and complexity. The wine opens with a rich nose of near-sweet red crushed fruit tinged with warm spices, nuanced toasty oak and hints of dark chocolate, cedar wood and a light overlay of roasted herbs. The medium to full bodied palate is elegant and refined with nicely integrating tannins providing ample backbone for the deep fruit and layered complexity with a pleasing bitterness that rises and plays out through the supple and lingering finish is tinged with rich dark chocolate and Oriental spices with a whiff of herbaceousness that pleases. Truly a beautiful wine and I’d agree with Golan that it’s his best effort to date. Drink 2020-2028. Tzora, Misty Hills, 2015: Another wine that earns its way onto this list with relative ease. Given the winery’s history of careful excellence, one shouldn’t be surprised that nearly every vintage at Tzora shows improvement over the prior, regardless of the quality of the particular vintage in question. Eran Pick’s meticulous nature combined with a certain level of humility that enables him to continue learning from the terroir and improving on his incredible creation are likely partially responsible for the continuous uptick in quality (in addition to the consulting advice from Chateau Petrus’ retired winemaker – Jean-Claude Berrouet), but regardless of their genesis I can only say thank you. Taking its name from the early morning fog that is often blanketing the “Fossil Vineyard’ from which the grapes are sourced (and only the best plots from the vineyard are utilized for the flagship wine), this year’s blend is comprised of 66% Cabernet Sauvignon and 34% Syrah (see my note for the noble above with respect to the continued use of Bordeaux varietals by these wineries) which spent two years in French oak. The dust storm of 2015 wreaked havoc on most Israeli wineries and Eran’s decision to harvest a little earlier has paid dividends in the form on a more austere wine than ever before (including from the colder than usual vintage of 2011) with subtlety and restraint being the hallmark of this Über professionally-made wine. Give the wine a little air and you will be rewarded with a rich nose of mostly red fruit with some dark black fruit nuances providing pleasing complexity alongside floral notes and typical roasted herbs with black pepper, earthy minerals and a whiff of minty chocolate completing the picture. The palate is medium to full bodied and surprisingly approachable with elegant tannins nicely integrated and showcasing good acidity alongside the pungent forest floor, tart red fruit, hint of slightly toasted oak and rich chocolate. A long chocolate and herbal-laced finish is supple and with a pleasing bitterness on the finish. Drink 2019 – 2025 [Shmittah]. Yatir, Forest, 2013: The winery’s flagship blend continues to be well-deserving of its position in the portfolio and was recently selected (along with Flam’s 2013 Noble reviewed above) by Jancis Robinson as one of her favorites from a recent tasting in Israel of local wines. This year’s blend is comprised of 68% Cabernet Sauvignon and 32% Petit Verdot harvested from the winery’s dessert vineyards located upwards of 900 meters high. The high percentage of Petit Verdot is helpful in maintaining the wine’s characteristic profile of an iron first in a velvet glove. A subtle but extracted nose of primarily dark fruits with sun-warmed sage and rosemary providing nuanced complexity to the toasty oak, cigar-box tobacco and warm cedar. Nice black pepper, mocha and hints of red fruit add to the layers that slowly reveal themselves over time on the elegant yet powerfully built full-bodied palate. Gripping tannins are still integrating and will continue to provide a solid structure on which the rich and controlled fruit will express itself for years to come as the wine presents in great harmony and with the elegant balance we have come to expect from Yatir’s Eran Goldwasser. A luscious finish lingers long. Drink 2019-2027. De La Rosa, 613, Ashray Ice Wine, 2009: I first encountered this label at KosherFest a few years ago where the few wines on offering were insufficient to garner my interest. I was therefore happy to discover two Austrian Icewines at a tasting earlier in the year with this one being truly delightful. De La Rosa Real Foods & Vineyards, is a family-owned business hailing from Austria who have been producing wines for nearly 800 years and named the company for the 18th century Sephardic kabbalist Rabbi Chaim De La Rosa of Salonika (since natural healing was a focus for him). Hajdu, Counoise, Eaglepoint Ranch, 2014: Recognizing the value of a wine club, Hajdu joined the growing number of wineries who have heeded my advice and launched these direct to consumer lines of communications, offering loyal customers the chance for special wines made available only in limited quantities. Continuing his love of Rhone varietals, Jonathan included this Rhone Valley varietal with his first offering of the adventurer’s Guild. Counoise is one of the 14 varietals allowed in of Châteauneuf-du-Pape with Château de Beaucastel’s Perrin family being such big proponents of the grape that nearly 5% of their blend (known for using all 14 allowed varietals in the blend) is Counoise while also being responsible for bringing the grape to California (via their family owned grape nursery in the state). This is the first (and to date, only) experience with the varietal as a stand alone offering so I was excited to try it, especially given Hajdu’s well-known talent. A warm and rich red nose has plenty of cherries, cassis and warm brown spices which are noticeable on the medium bodied round palate with good acidity and supple tannins that lead into medium finish with tart raspberries and spices lingering nicely. 14.5% AbV. Drink now through 2019. Jezreel Valley, Dabuki, Pét-Nat, 2016: To my knowledge, Jezreel currently makes the only kosher version of this genre and this was the first time I had ever tasted the genre for myself. In addition to the novelty of the ancient grape coupled with ancient winemaking techniques, I enjoyed the wine as well, especially after it had some air and much of the cabbage-like funkiness blew off. Even so, there was plenty of funk on the nose reminiscent of ripe cheese, wet earth, rain-slicked flint, minerals and some grassy notes. Decent mousse and sufficient acid kept the wine alive while it aired out and sat in the glass over the course of the hour it was tasted where subtle green apple and slightly-sweet notes of melon developed. The funky notes were actually enjoyable (it smells like winemaking) and it was a fun experience with a low 11.5% AbV. While not a wine I’d drink regularly, it was certainly an interesting and pleasing experience that I’d recommend to any interested oenophile and the winery is currently anticipating releasing two different Pet-Nat wines for the 2017 vintage, some of which will hopefully make its way to the United States [Only in Israel]. Nik Weis, St. Urbans-Hof, Gefen Hashalom, Riesling, Saar, 2016: The third release from the German Nik Weis winery of a German Riesling as part of the “Gefen Hashalom” collaborative project between a number of Mosel vineyards (stay tuned for Rieslings Weingut von Hövel from the other two partners in the project – Hans Wirsching and Weingut von Hövel). Due to various logistical issues, this year’s version hails from the superior Ockfener Bockstein vineyard resulting in a more complex and longer aging wine (in addition to the increased price tag). Sourced from Mosel’s Saar sub-region, this elegant and light to medium bodied wine has a near-ethereal feel to it with great acidity backing up rich fruit and layers of complex aromas and flavors that tantalize. Currently the wine needs some aerating in order to showcase its potential but allow it the time and you will be rewarded with rich notes of white stone fruit, rich sweet orange citrus notes and warm spices on a refined and elegant nose. The palate is less viscous than the 2015 slightly sweeter vintage but is balanced by terrific crisp acidity and a depth of character that intrigues along with hints of limestone and flinty minerals. While enjoyable now, the wine will only improve over the coming years and it would be a crying shame to miss out on its expected wondrous development so be sure to stash some bottles out of range to ensure longevity. Drink now – 2026, likely longer [Only in the US]. Recanati, Single Vineyard, Ancient Grapes, Bittuni, 2016: The name likely originated from the grape’s origin (one of two villages located near Chevron or Ramallah), the hardy grape is known to produce copious yields and with high levels of sugar, is one of the Arab world’s primary sources for raisins (I think we can all agree that the lovely wine is a better use for the grape). 50% of the wine was whole-cluster fermented, following which it spent approximately six months aging in one year old French oak barrels. A lovely and lithe wine, it comes packed with bright fresh near-sweet notes of red fruit including cherries and plums, violets, light warm spices, soft tannins and great acidity. Light to medium bodied, the wine is slightly reminiscent of Gamay (from which Beaujolais is made). A perfect accompaniment to late evening summer meals (or anytime else) with the characteristically low alcohol (12% AbV) found is most of these revitalized ancient grapes. Drink 2018-2020. The third vintage (2016) of Recanati’s Marawi is worth mentioning as quality improves on an annual basis for this indigenous grape. 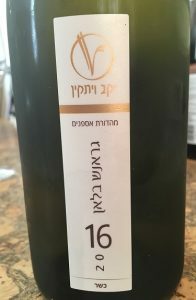 Tzora, Or, 2016: If visiting one of Israel’s best wineries and meeting Israel’s only Master of Wine was enough of an incentive, this Ice Wine-styled treat is only sold at the winery and would be incentive enough on its own to visit the picturesque winery located in Kibbutz Tzora and sourcing its grapes from among the best Judean Hills’ vineyards. The wine is made from 100% late-harvested and cyroextracted Gewürztraminer grapes sourced from the winery’s acclaimed Shoresh vineyard. With a voluptuous and fresh nose of candied apricot, white peaches, guava, lychee, honeysuckle and candied pineapple and with sugared citrus, roasted nuts spices and lovely floral, most of which is present on the acid-loaded full-bodied and slightly viscous palate. Drink now through 2024 [Only at the Winery]. Yaacov Oryah, Old Musketeer, 2008: with a day job making clean and well-crafted wines for Psagot, Yaacov Oryah expresses his well-deserved reputation of unconventionality in the growing portfolio of wines bottled under his eponymous label. While I am not yet convinced of the merit behind his planned focus on orange wines, I certainly appreciate the non-conventional winemaking method and mélange of wines produced. Currently only available in Israel directly from Yaacov, these are certainly wines well-worth seeking out and bringing back to enjoy. After revamping the port-style offering from Psagot (now marketed as “Devine” and after a serious qualitative upgrade, is well worth seeking out as well), Yaacov serves up one of the most intriguing dessert wines I have enjoyed to date. A limited edition of 1,000 bottles, the wine is late harvested Muscat of Alexandria spent seven years aging in used oak barrels before being blended with 6% 2015 Chardonnay which provided acidity to back up the rich sweetness and balanced out the oxidized notes that give the wine its complexity and testify to its potential longevity. The long-term aging is intended to allow the wine to slowly mature and oxidize providing it with complex flavors while also protecting it from future deterioration due to oxidization, thus prolonging its ageability. Additional wines remains in barrels and Yaacov will likely bottle it in a few years as the wine continues to develop in the barrels. A lively and aromatic nose and a full bodied and rich palate back by good acidity are both redolent of honeysuckle, blooming white flowers, crème brûlée, toasted hazelnuts, white chocolate, candied lemons, a hint of white pepper and expressive notes of tropical fruit all balanced by warm spices and spicy oak and a long lingering sweet finish that is enhanced by great spices and more developing complexity. 15.9% AbV. Drink now through 2035, likely longer [Only in Israel / Shmittah].